What is coronary angiography ? What is left heart catheterization ? 1. What is coronary angiography ? The angiography is a medical imaging technique used in cardiology to visualize the coronary arteries. This is an additional medical examination invasive technique that uses X-ray and injection of iodinated contrast. It is a very accurate exam that can help to treat a coronary lesion in the same time (coronary angioplasty). This exam is performed in hospital. X-ray equipment used in cardiac catheterization lab. 2. Which is left heart catheterization ? Left heart catheterization is always done at the same time as coronary angiography with a special catheter called Pig Tail. It helps to measure the hemodynamic constants (pressure, resistance) and partly to make radiographs after opacification (injection of opaque product) within the left cardiac chambers. 3. What are the indications ? Sometimes, the coronary angiography is performed before surgery especially when the patient has cardiovascular risk factors. The coronary angiography may be proposed to explore stabilized heart failure that can be indicative of coronary disease. right heart catheterization to measure intracardiac pressure and cardiac output. coronary angioplasty. In some cases it can be done in the wake if there a significant coronary stenosis. 4. How is the test done? The doctor has the results of routine tests (ECG, RX thorax taken blood ...). The patient is fasting. The area where the catheter must be inserted (the fold of the groin, arm or forearm) is shaved and washed with an antiseptic solution to prevent infection. 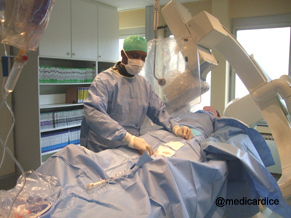 The patient is then covered with a sterile field. An intravenous infusion is set up. The patient is lying on its back on the exam table. A continuous ECG monitoring is established. The invasive-cardiologist wears a lead apron (to protect against excessive exposure to ionizing radiation) and is dressed sterile. The cardiologist administers a local anesthetic by injection under the skin in the area where the catheter must be inserted (the fold of the groin, arm or forearm). It injects the femoral artery (if the insertion is in the fold of the groin) or brachial artery (if the insertion is in the arm) or the radial artery (if the insertion is at of the forearm) and sets up the sheath. The doctor moves the catheter to the coronary angiography and visually controls the exam by fluoroscopy. When the catheter is positioned, it makes a contrast injection and records the images with different plans. The catheter and the sheat are removed and the artery is compressed manually to prevent bleeding. A compression bandage is established and the patient can return to his room. It is also possible to perform hemostasis (all phenomena to stop bleeding) at the end of coronary angiography with material that can seal the drain hole in the artery (angioseal, starclose). The mobilization of patients can be done earlier (after 2 hour). When the examination is performed by radial immediate mobilization is possible. The patient remains under supervision in the hospital. The compression bandage is kept for several hours after coronary angiography when a femoral approach is used. It is then removed if the local state is satisfactory. The mobilization is possible according to the instructions of the doctor who performed the examination (between 1 and 6 hours). Biological control of renal function may be done the next day. In most cases the patient can return to his home the day after the examination. The coronary angiography, in general takes less than thirty minutes. The test is not painful (the only unpleasant part can be local anesthesia). It may be uncomfortable for longer lying down on a relatively hard table. Each injection of contrast may be accompanied by a brief sensation of heat.